HMHS Britannic liner launched in 1914, history, sinking and images. Work started on the third and last of the White Star Line’s Olympic class ships November 30th 1911. The White Star Line had intended to name this ship Gigantic. After the sinking of her 46,328-ton sister ship Titanic, they decided Britannic was a more suitable name. New safety requirements after the Titanic disaster led to Britannic’s double skinned hull and bulkheads being extended to above the waterline. She also had to be fitted with enough lifeboats for all the passengers and crew. 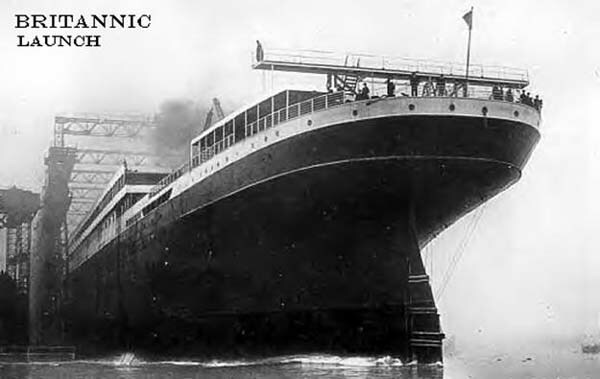 At the time of her launch, Britannic was the largest ship to have been built in Britain. The British Government ordered work on her fitting out to be suspended after the outbreak of World War One in August 1914. Nearing the end of 1914, Britain’s First Lord of the Admiralty ‘Winston Churchill’ made a catastrophic miscalculation by planning the invasion of Turkey (the Gallipoli Campaign). Over the eight and a half months of that battle, 141,000 Allied servicemen were either wounded or killed. At that time, the Cunard liners Mauretania and Aquitania were unable to keep up with the transport of wounded soldiers from the Mediterranean ports back to Britain. This forced the British Admiralty to requisition Britannic to serve as a hospital ship. Britannic’s interiors were divided into wards at Harland & Wolff before she set out for Liverpool to be loaded with beds, medical equipment, a staff of 52 officers, 101 doctors and nurses, 376 hospital attendants and a crew of 675 men and women. The conversion gave her the capacity to carry over 3,300 patients. Before entering service, the Admiralty gave her the title ‘His Majesty's Hospital Ship Britannic'. On December 23rd 1915, she set out on her maiden voyage from Liverpool - Naples and the Greek Island of Lemnos to pick up wounded soldiers. During her sixth voyage on that route, while passing through the Kea Channel/Greece, on route to Lemnos November 21st 1916, she either hit a mine or was torpedoed. It is thought Britannic’s crew must have had the bulkhead doors open to change shifts at that time, as she began sinking bow first at an alarming rate. After she came to a stop, the crew began lowering lifeboats into the sea. Her captain had the engines restarted at that time thinking he might be able to run his ship onto a beach. This led to the death of most onboard one of the lifeboats after it was sucked into the propellers. About 55 minutes after the explosion, Britannic’s stern rose hundreds of feet into the air as she slowly disappeared beneath the sea. Of approximately 1,066 people on board, 30 lost their lives. One of the survivors was a nurse’s aid Violet Jesop. She had also worked as a stewardess on Olympic when it collided with the British cruiser Hawke, and survived the sinking of Titanic after being transferred to that ship for its maiden voyage.